So I've been trying to diagnose a problem with Windows 10, it won't let me update to the newest feature update. One way I was trying to fix it was changing some settings and turning off a few things in the BIOS. I decided I needed to reset everything back to default and of course forgot to swap the settings back for RAID support. So I have a 4x6TB RAID 10 setup that's dead atm. Right now in Disk Manager I have two disks unaccounted for. One that's 2794GB and has a large RAW partition, and another that's 11178GB and has two different unallocated partitions (that I had to "initialize"). As a side note, I have an SSD and two different storage drives to accompany the RAID and one of the storage drives isn't showing up too, rather odd. I followed the suggestions to check my Intel BIOS setup. Two of the drives that were supposed to be in RAID were not, so I unselected the two that were and put the drives back in RAID 10. Then I followed the main guide for TestDisk, including finding files and everything, and wrote everything, figuring it would work. Fixed the boot, did everything I was supposed to do and I still got nothing. Now I can't even view the files that were there anymore. TestDisk is still finding the one partition, but I'm having it deep search atm to see if I screwed something up (does it matter if it's in Intel or EFI? EFI is incredibly slow and it was originally selecting Intel I think). Am I doing something wrong here or am I just being impatient and not waiting on the deep search? With disk over 2 TB (or Raid over 2 TB), you should use EFI GPT. 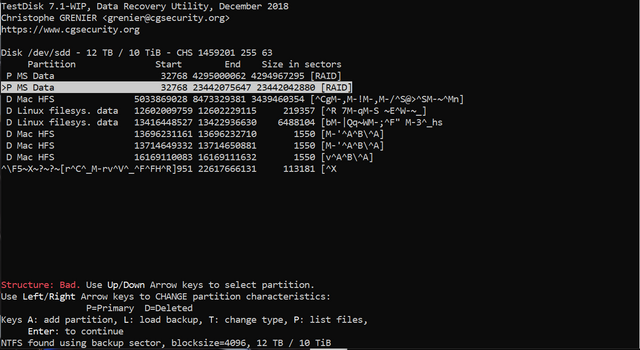 This is what I've got now and it told me that the two MS Data partitions are not recoverable. The second one was the right one. It needed a chkdsk run on it, but it worked afterward. All my files are there and it saved me the trouble of having Backblaze send me a hard drive.